In 1985 when visiting Illinois USA at the home of my dear friend, storyteller Jim May, I took part in a workshop with New York Jewish storyteller Susan Klein. She told a story of a Chinese mandarin and a Sunflower, giving me permission to bring it home and tell it. 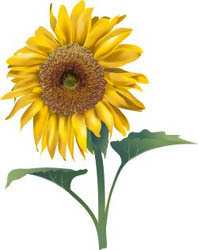 In my hands it became a story of a mayor and a sunflower. I hope you enjoy it! The Mayor of the town was old; the time was approaching when he had to retire. His last job would be to choose a successor. Lots of people wanted that job, for you were driven round in a big car, for lots of free meals. There was one young boy called Jack who was desperate to be the new mayor. The old mayor had a problem; he was spoilt for choice, so he went to seek the advice of the wisest man in the town, Mr Merryweather, the Gardener. Together they came up with a cunning plan. The following day all of the candidates lined up outside with their hands outstretched. On the end of the line was Jack. The mayor walked along the line, placing two sunflower seeds in each of their palms. He told them they must go home and plant the seeds in a pot. They must return in a month and whoever had grown the biggest and best sunflower would be the new mayor. Jack ran home and found a large brown pot. He filled it with soil, made two holes with stick, and planted the seeds. He pushed the pot out into the sunshine and rain, washed his hands and went to bed. The next morning Jack raced downstairs to his pot, looking for any tell-tale green shoots, but nothing grew. And so it was every day. All Jack had was a pot of dirt. At the end of the month Jack's mother told him he should take the pot to the mayor's house and see if he had won. With a tear in his eye, Jack told her there was no point, as all he had was a pot of dirt. His mother told him he had to go as he had done his best. Sadly, Jack took the pot to the mayor's house and stood in line with tear trickling down his cheek. Ahead of him were people bearing pots burgeoning with enormous ripe yellow flowers. The mayor came out and gazed down the line, a line of enormous bright yellow flowers and on the end a tearful Jack with his pot of dirt. The mayor pointed to Jack, telling him that he would be the new mayor. Surprised, Jack reminded the mayor that there were loads of people with enormous flowers and all he had was a pot of dirt. The mayor told him that he had given everyone the same seeds, and before he had given them he had boiled them so they could never grow. So Jack was the only one who had been honest, and therefore the only one fit to be his successor.